Never Enough Nails: Fun Holo and Crackle Look! I don't have time for a super long post today, but I REALLY wanted to show you this look I wore this weekend. I really loved it and it was fun to look at. 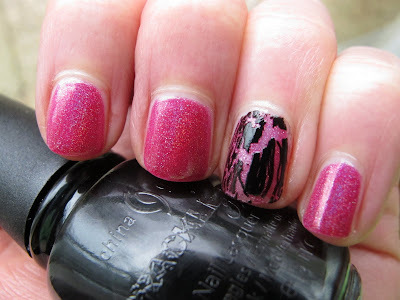 I wore an old OPI Designer Series polish called Divine. 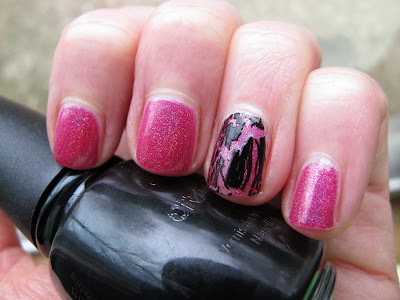 Then, on my ring finger I did an accent nail of Divine under China Glaze Black Mesh! 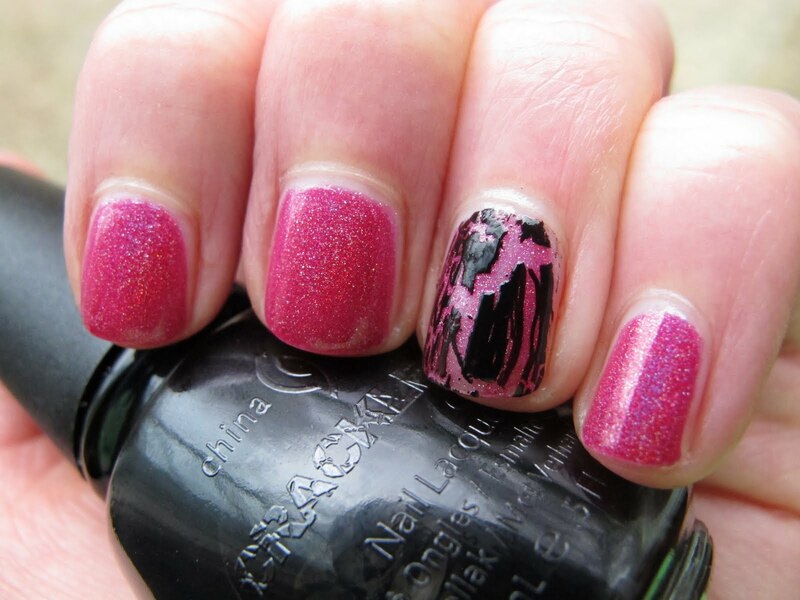 You know I love my Crackle polish, and for some reason, I felt the crackle actually stood out more when it was just the one nail. It made me really notice it, whereas sometimes when I have crackle on all of my nails it seem like it just blends together. Using Black Mesh for an accent nail is a really graphic, bold look. I loved wearing it and I got a ton of compliments on this mani. OPI DS Divine is an old black label OPI. I do not believe it is available anywhere now, but a good substitute would be Nubar Prize. They are very similar (as you can see if you go check out that post). I hadn't used Divine in awhile and TOTALLY forgot how badly non 3-free polishes SMELL! I've become spoiled with all of the 3-Free polishes. I completely forgot how polish used to smell. It practically made my eyes water. However, I really love this color, so there's no chance I'm getting rid of it LOL. What are you currently wearing on your nails? New Spring 2011 stuff? Or are you sporting some oldies? Thanks Manicured Monkey and The Nail Addict! I enjoyed wearing this one!